We are very sorry to report that our wonderful friend and colleague Kathy Shaw died Sunday evening at St. Vincent’s Hospital in Worcester MA after a long illness. Kathy had been a distinguished and award-winning religion reporter at the Worcester Telegram & Gazette, as well as a mental health crisis counselor and a union activist. Beginning in 1992 and continuing through 2005, Kathy did groundbreaking reporting on the clergy abuse crisis in the Diocese of Worcester and beyond. In 2002, she started working on Abuse Tracker, the news blog about the clergy abuse crisis created in March 2002 by Bill Mitchell and the Poynter Institute. The byline “Posted by Kathy Shaw” first appeared on June 12, 2002, when the U.S. bishops were meeting in Dallas. 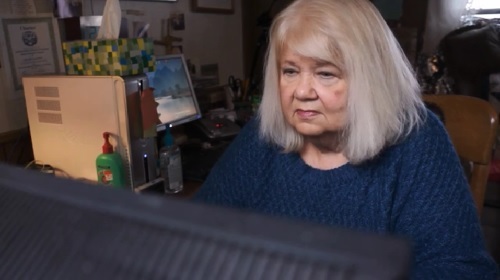 In the sixteen years since, Kathy posted tens of thousands of articles in Abuse Tracker, transforming the news blog into an indispensable resource and record, used by everyone who works on the clergy abuse crisis or cares about it. Thanks to Kathy and Abuse Tracker, every local development in the abuse crisis could be followed by people everywhere. Abuse Tracker was hosted by Poynter for a year, then by the National Catholic Reporter until 2006, and then by BishopAccountability.org, where it will continue. Kathy Shaw was a steadfast friend, a tireless and generous colleague, an exuberant presence on social media, and a loving advocate for survivors everywhere. When arrangements for her memorial service are set, we will announce them here, along with a longer appreciation of her life and legacy. • See Kathy's obituary in the New York Times and an appreciation by Bill Mitchell in the National Catholic Reporter. • Please view a brief video about Kathy. • See also the bio that Kathy wrote when she and Abuse Tracker joined BishopAccountability.org.